LOUISVILLE, Ky. – March 25, 2015 – New options from Freightliner Trucks for the Freightliner Cascadia® and Cascadia Evolution will add to the driver’s overall comfort, safety and productivity. 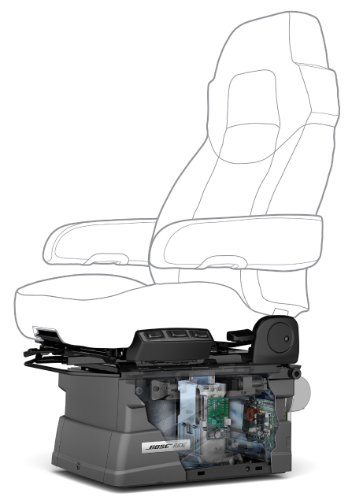 Bose Ride® system II truck seat suspension. Studies have shown that almost half of all truck drivers suffer from fatigue and pain levels serious enough to interfere with their work. The Bose Ride system eliminates this problem for nearly all drivers*, regardless of vehicle specification. As a result, drivers feel safer, recover faster, and expect to have a longer driving career. Featuring advanced technologies including sensors and a powerful regenerative electromagnetic motor, the system counteracts the shaking and jarring potentially experienced by drivers on the road. Introduced earlier this year, this next-generation Bose Ride system features a Ride Control selector, allowing drivers to customize their ride; enhanced seat-top ergonomics for improved driver comfort; and a new built-in driver orientation module to help first-time users understand how to get the most from the system. SmarTire® Tire Pressure Monitoring System (TPMS) from Bendix CVS. Improper tire inflation both increases tire-related costs and has a detrimental impact on fuel efficiency. SmarTire TPMS shows real-time pressure and temperature status on a dash display, instantly informing the driver if there is a tire problem on the road. The sensor is mounted inside of the tire on the wheel to capture accurate tire temperature and pressure and to protect the sensor from damage. Flat Screen TV mount with antenna. The Cascadia and Cascadia Evolution roomy cabs offer features such as a plush memory foam mattress, ample storage and waist-level refrigerator. Drivers can now add a swivel TV mount for up to a 26-inch flat screen TV with an antenna that can be securely stored when not in use. For more information, visit the Freightliner Trucks booth (#30125 at MATS, or go to www.FreightlinerTrucks.com. *As reported to Bose during the “Impact to Ride Quality on Truck Driver Health & Safety. A TCA Member Fleet Case Study,” March 11, 2014. The Bose Ride system counteracts the shaking and jarring potentially experienced by drivers on the road.